TruGreen has put together some great Fall lawn care facts to help keep your lawn healthy. According to the majority of homeowners (79 percent) surveyed, “in selling a home, it is important for the lawn to be in top shape to get the best price.” Fall is the best time to prep lawns, trees and shrubs for spring’s growth cycle, especially with the home buying season right around the corner. 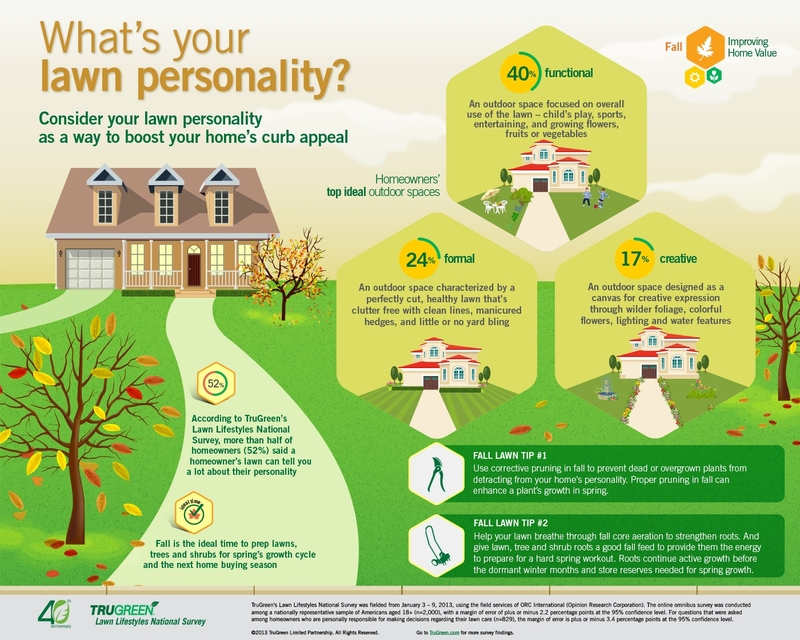 In TruGreen’s two new fall webisodes, Jason Cameron, licensed contractor and TV host, talks about fall lawn care and also how your lawn personality can be a way to improve your home’s curb appeal. In episode one, he describes the top three types of outdoor spaces and also provides guidance on corrective pruning in fall to prevent dead or overgrown plants from detracting from your home’s personality. In episode two, Cameron reinforces the importance of fall lawn prep with emphasis on core aeration to help your lawn breathe and to strengthen roots. TruGreen takes a scientific approach to a lawn you’ll love with Ph.D. agronomists developing the training for each TruGreen certified lawn specialist. TruGreen’sspecialized lawn services are designed to specifically meet your lawn’s needs at key stages throughout the year based on climate, grass type, soil condition and usage. Partner with a TruGreen specialist for a tailored lawn plan to give your lawn exactly what it needs at just the right time to get the most out of your lawn. Go to TruGreen.com for additional healthy lawn and landscape tips to boost your home’s first impression. For more information and to schedule lawn care services visit www.TruGreen.com or follow TruGreen on twitter.com/TruGreen or facebook.com/TruGreen. We usually get ours aerated every couple of years, this year we didn’t but next year I will consider TruGreen to do ours, I didn’t know they offered it. This is an awesome resource. I like to be more creative with my lawn. Cute infographics btw and thanks for the tips! Mine is a mix between functional and creative 🙂 Function comes first but I love adding creative touches. It’s winter right now and we aren’t really doing much for our lawn, but before you know it, it will be Spring again! We need to do a better job of keeping out the weeds this year. They over take your lawn so quickly! I do not, they did provide me with a years worth of service and my lawn was a trainwreck. By the end of the year it was a gorgeous lush lawn again, I would recommend them.